Edited by dalee, 4 weeks ago. I liked when OVERLORD gave his hand to get the trophie but you didn't give him immediately.... was it to create more suspense? Do you allow me to use this video for my presentation in school? You can use any video from Patras Stratego Team 's YouTube channel. 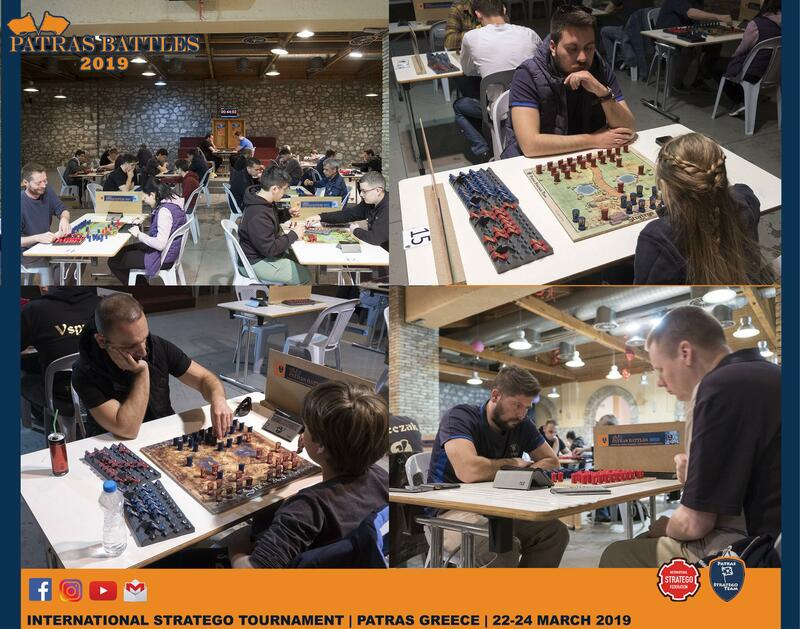 Also, for those who interesting, a report of Patras Battles 2019 is going to posted shortly. Great tournament, congrats to the winners ! As always amazing organising work from PST , hope to come back there soon ! 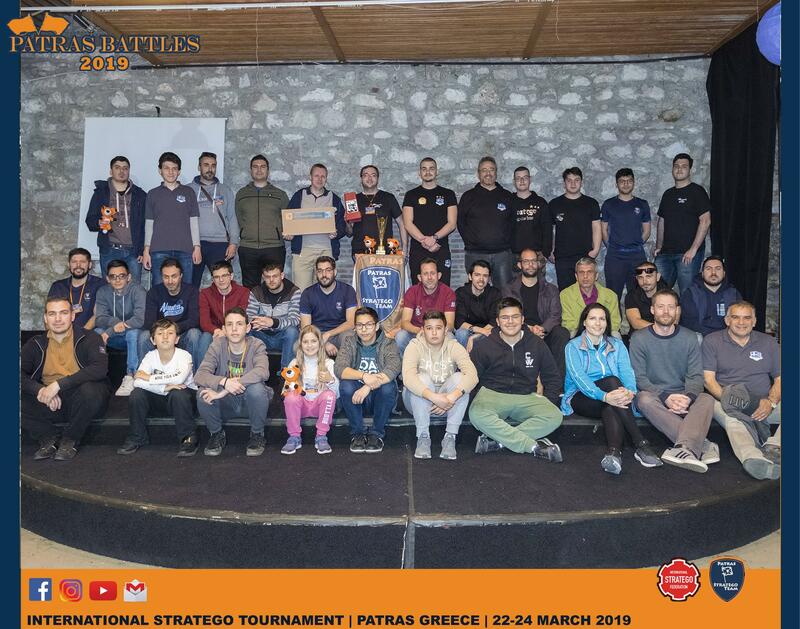 For the 4th consecutive year, Patras Stratego Team organized the International live Tournament “Patras Battles 2019”, on the weekend 22-24 of March. The Dutch Champion and first player in world classification point list Niemeijer Pim, the last World & Greek Champion Vandoros John, the top UK player and last Patras Battles Champion Palley Charlie, the USA Champion Baron Angel and the Dutch Top Player Baas Dennis honored by their participation the Patras Battles 2019 tournament. 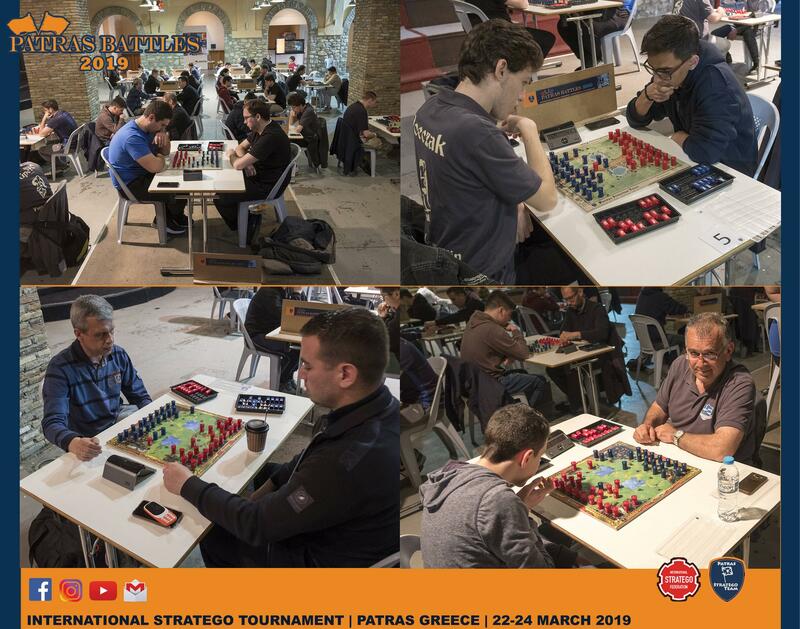 Also the Greek Elite was there as many Senior and qualified Junior players from Patras Stratego Team. 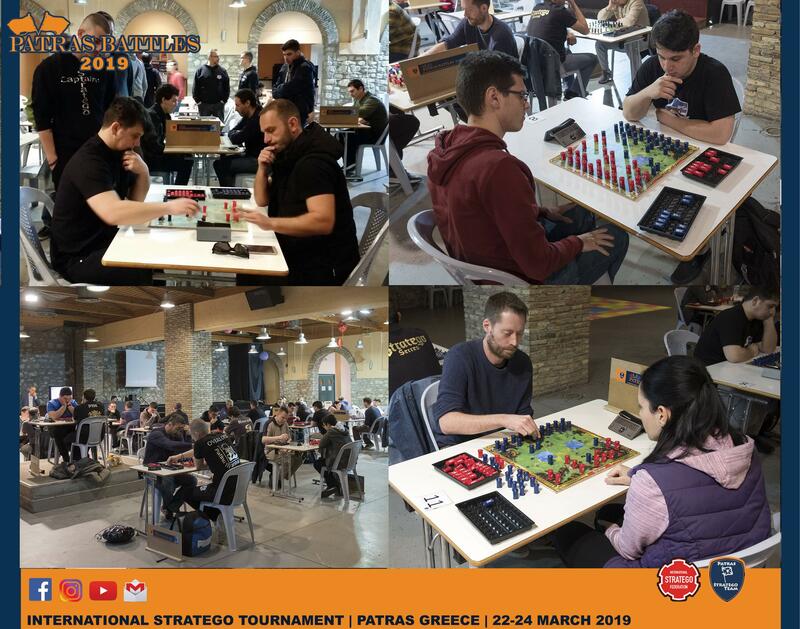 The tournament took place in a very beautiful atmosphere, at the Egli hall - Veso Mare mall in Patras, where the participants, many spectators and the organizers enjoyed every moment of the event. At Friday 22th of March, Junior category was held with 18 junior participants. After 5 rounds, on Swiss Perfect, Karelas Gerasimos won the 1st place, Dimopoulos Ioannis the 2nd and Molonis Georgios the 3rd. The main event was held on Saturday and Sunday with 36 participants. 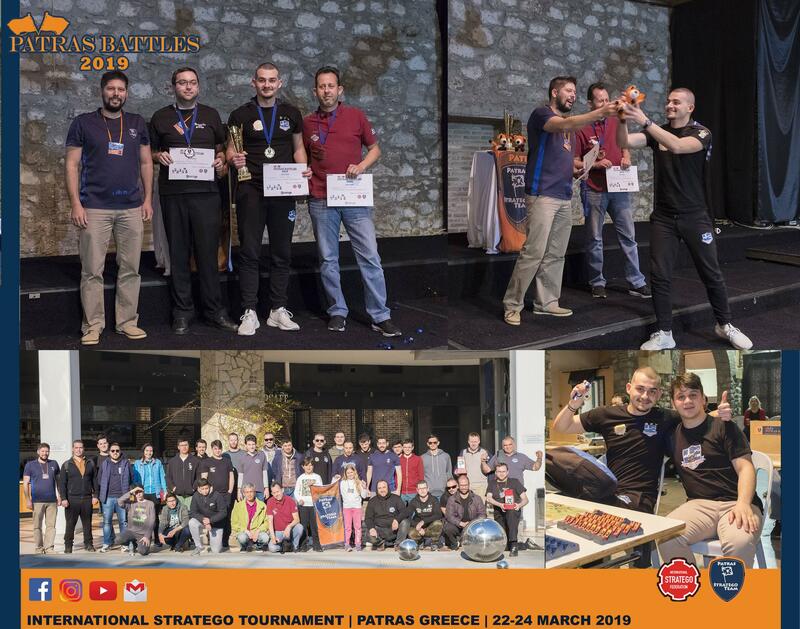 In the opening ceremony there was a presentation of all players along with the trailer of Patras Battles 2019. Also Vandoros John awarded by Baas Dennis as the winner of 4th Online World Championship (WCO). 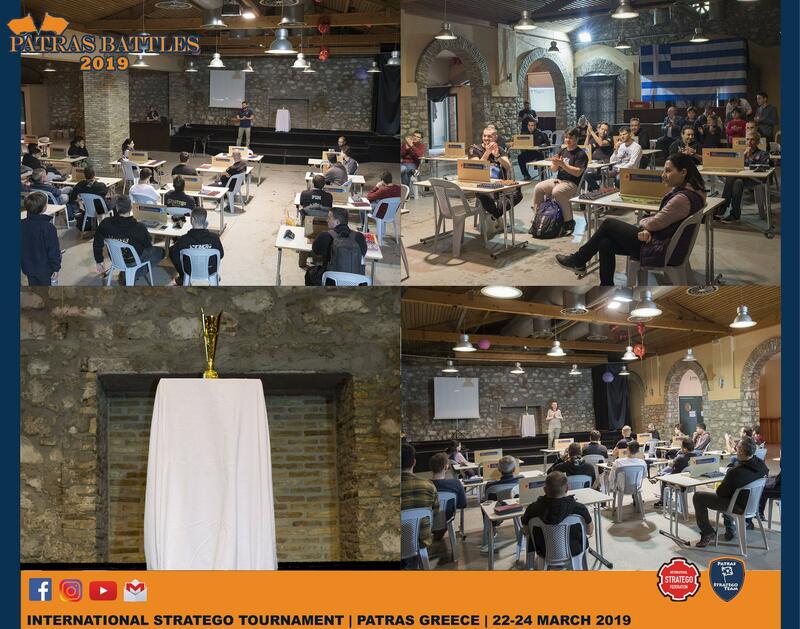 All the players got the registration package with a memorial T-shirt, certification diploma, information booklet, free key password for Strategeiras app and their Patras Battles 2019 ID card. 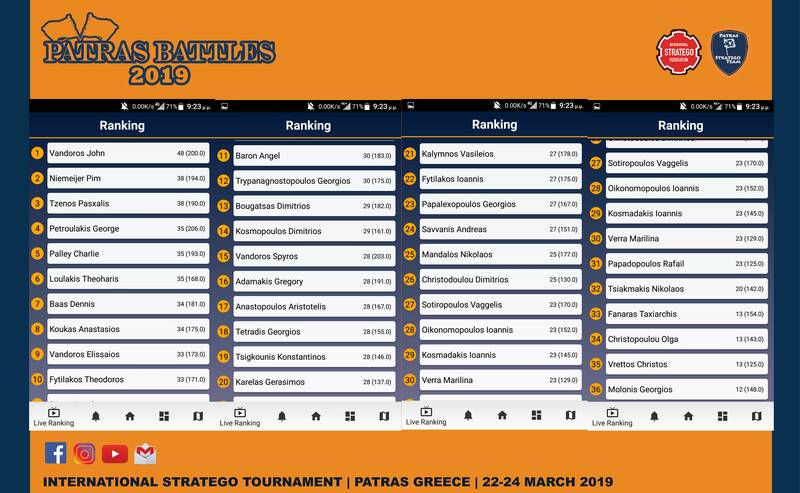 Patras Battles 2019 followed the Swiss Perfect tournament system with eight (8) rounds. 3 rounds played on Saturday and the rest played on Sunday. The new Patras Stratego Team’s boards gave extra convenience to players on the games. The games started with the best moral for the players and at the end of the first day, in the top of the standings were Niemeijer, Vandoros and Petroulakis with 3 wins. On Saturday night, the official dinner organized at “To Neon cafe&restaurant” with delicious appetizers, mixed grill plates and plenty of beer & greek wine and friendship mood of the players. The second day started with a big game. Pim Niemeijer and John Vandoros had to face each other on the first table. After a great job from Vandoros, the 6 points of the winning went in to his pocket. On that point, Vandoros knew that he could manage the rest of the games in order to keep him on the first place. In the other hand Niemeijer lost from Petroulakis and fell in standings. But Petroulakis after his won against Koukas, lost his energy, and he couldn’t manage the rest of the games. Niemeijer won the three last games and got the second place. On the other hand Tzenos, on the first day had two losses by his mistakes, against Niemeijer and Vandoros. But the second day started for him very well and at the last game against Petroulakis, he got the win and the bronze medal. For the gold medal, Vandoros won also Baron and with 8 wins got the first place and the prize of MVP of the tournament. As MVP player, he got a marshal LopiX”, the mascot of Patras Stratego Team. On the awards he raised the trophy on Patras’ sky with total satisfaction on his face! Pim Niemeijer announced all the details about next World Championship 2019 in England. Tzenos invited all Greek players to the next Greek Championship 2019(Serres) and Palley Charlie, Baron Angel and Baas Dennis gave a speech to the audience for the closing of the tournament. Patras Stratego Team and org. 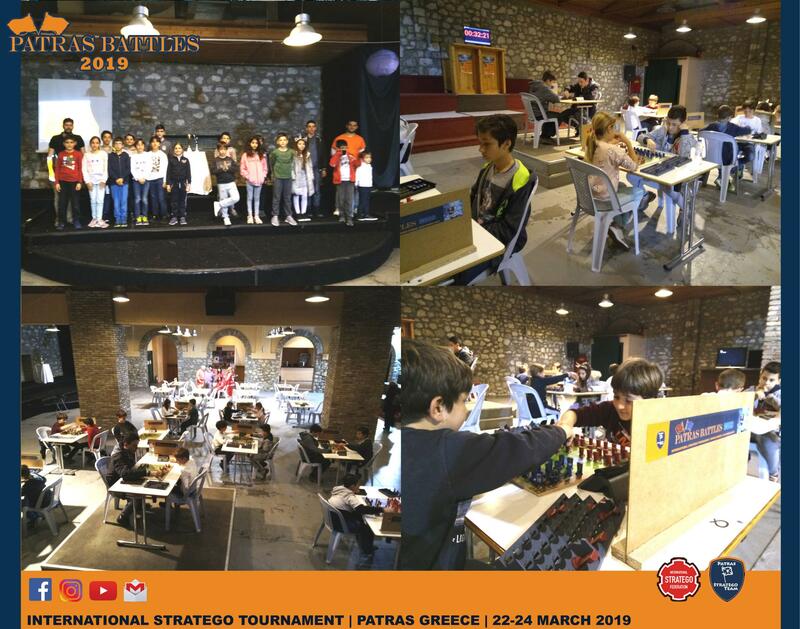 team of Patras Battles 2019, want to thank everyone for their participation. Also, look forward for the next year 2020, in order to welcome even more important players from Worldwide Stratego, as the tournament raises level every year and offers great emotions and excitements. Red Cross gave his support in order to avoid any unexpected accident. “To Neon cafe&restaurant”, the book store “To Donti” and the printing center “copy25” supported the tournament. Also, the media supporters were: TV channel “SuperB”, radio station “Wave97.4”, the newspapers “Tetarto”, “Match Achaias”, “VPRESS”, and web news sites “Tempo24.gr”, “imerisios.gr”, “dytikosaxonas.gr”, “DytikaNea.gr” and “happyweek.gr”. Sorry, forgot to mention - yes he was right on all three counts. Which was annoying. This all sounds very good . Kudos for Dalee! You brought the organisation of a stratego tournament to another level! Hope I can join this great event someday! Congrats to Angel/Fks/Sorrow for his very honorable representation of the USA at Patras! 11th place in such a field is quite an accomplishment. Good job!